At the insistence of the United States, members of the U.N. Security Council got a briefing on the situation in Nicaragua from the Organization of American States and a human rights activist. "You can't hear the suffering of the people and say okay, it's none of your business," said Nikki Haley, the U.S. ambassador to the U.N.. The United States and the Organization of American States (OAS) warned the U.N. Security Council on Wednesday that Nicaragua is a threat to international stability and is headed on the same path that led to a mass exodus of people from Venezuela. "Something needs to happen," said Nikki Haley, the U.S. ambassador to the U.N.. "We can't wait ... our job is not just peace and security, our job is prevention." Haley was speaking after she called a Security Council meeting Wednesday to address the Nicaraguan government’s violent repression of student and opposition protests that have killed over 300 people since mid-April. She said she hoped the meeting would give the OAS "the strength it needs" to continue its role as a regional mediator and give voice to the Nicaraguan people’s demands for early elections to remove President Daniel Ortega. But she got push back from Russia, China and Bolivia, who argue that other countries had no business poking their noses into its internal affairs, a common argument of rogue regimes. "You can't hear the suffering of the people and say okay, it's none of your business," Haley insisted. "We've heard that from Venezuela ... we are hearing that now from Nicaragua." Haley added that "it stopped being a Nicaragua problem" when thousands of people started leaving the country, as was also the case in Venezuela. "It becomes everyone's problem when you can't take care of the people that are in your country. 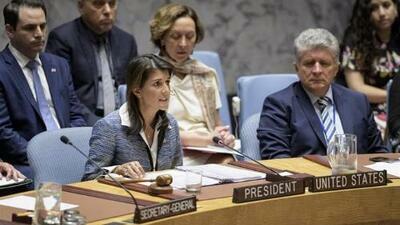 That is the role of the Security Council," she added. Ortega has defended the government's crackdown, calling the protesters "terrorists" working in coordination with foreign interests, and that were attempting to overthrow the Sandinista government. Officials pointed to the deaths of 22 police officers, which they say is proof the protests were not peaceful. Nicaragua last week kicked out a human rights team from the United Nations, just two days after it published a report detailing repression, torture and abuse of protesters by the government. Human rights activist Felix Maradiaga, who invited by Haley to address the Security Council, told reporters after the meeting that suggestions of foreign intervention were contradicted by the evidence on the streets. Opposition to Ortega was being led by poor students in public universities, as well as progressives and feminists, he said. "They are former Sandinistas who at one point believed in Mr Ortega's regime," he said. "This is not about ideology or political parties," he added. "Nicaragua is a time bomb"
Saying that Nicaragua has "exhausted" all domestic options, Maradiaga urged international pressure be brought on the Ortega government to restore negotations and hold early elections. "Nicaragua can become a case study of how a major regional conflict can be prevented because Nicaragua is a time bomb," said Maradiaga. In July, Ortega also broke off negotations with an opposition Civic Alliance, brokered by the Catholic Church, and has since adamantly insisted on staying in power until his term ends in 2021. The United States and the OAS Secretary General's office have backed support for early elections next year to end Ortega's rule. "When tensions like this are so high and violence takes place in such a way that leaves more than 300 people dead, you need to give the power back to to the people to decide," said Gonzalo Koncke, Chief of Staff of the OAS Secretary-General, who was also invited to address the Security Council. Democracy was "mandatory" for all OAS members and human rights abuses and violations of democracy were "something we cannot accept in the Americas," Kocke added. Nicaragua had two paths to choose from, negotation or a Venezuelan-style slide into instability, Koncke said, before adding, "No country wants to be another Venezuela."